Assigning addresses hierarchically in a network with hierarchical topology can reduce the size of routing tables. However, the configurator’s automatic address assignment with its default settings doesn’t assign addresses hierarchically. This part uses automatic address assignment, and the configurator’s routing table optimization features are turned off. 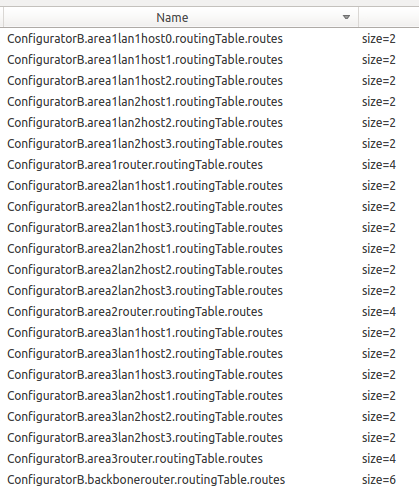 The size of routing tables in this part can serve as a baseline to compare with. The network is comprised of three areas, each containing two local area networks (LANs). Each LAN contains three hosts. The hosts in the LAN connect to an area router through switches. The three area routers connect to a central backbone router. The network contains three hierarchical levels, which correspond to the hosts in the LANs, the area routers, and the backbone router. 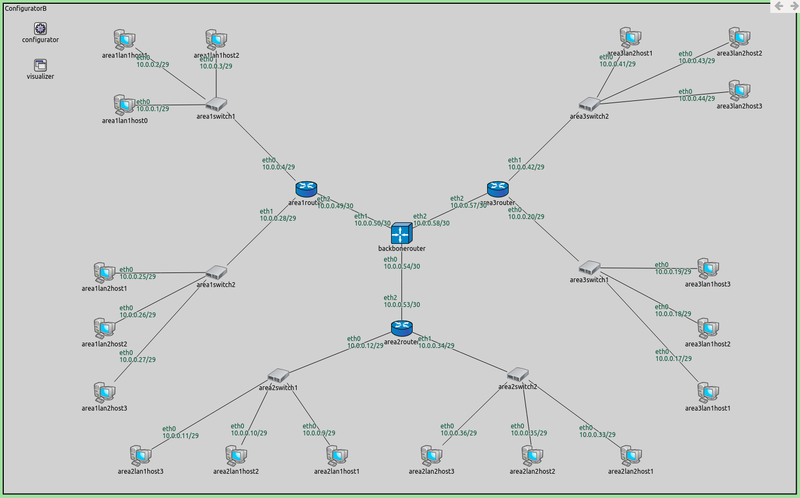 description = "Configuring a hierarchical network - A: non optimized, fully automatic IP address assignment and static routes"
This configuration turns off every kind of optimization relating to address assignment and route generation. This means that nodes will have an individual routing table entry to every destination interface. The routing tables of a host (area1lan2host2) and a router (area1router) are shown below. The backbonerouter’s routing table is similar to area1router’s. There are 30 interfaces in the network (18 hosts * 1 interface + 4 routers * 3 interfaces). All routing table entries have 255.255.255.255 netmasks, i.e. separate routes to all destination interfaces. Thus, hosts have 29 entries in their routing tables, for the 29 other interfaces. Similarly, routers have 27 entries. In this part, we turn on the optimization features of the configurator that were turned off in Part A. This should optimize routing tables and decrease table size. 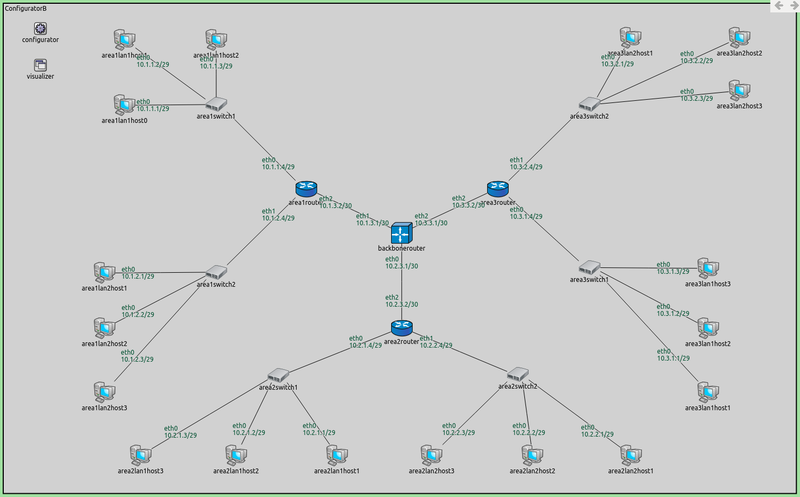 description = "Configuring a hierarchical network - B: optimized, fully automatic IP address assignment and static routes"
The configuration is empty, the default NED parameter values take effect. That means that the following optimization features are turned on: assignDisjunctSubnetAddresses, addDefaultRoutes, addSubnetRoutes, optimizeRoutes. 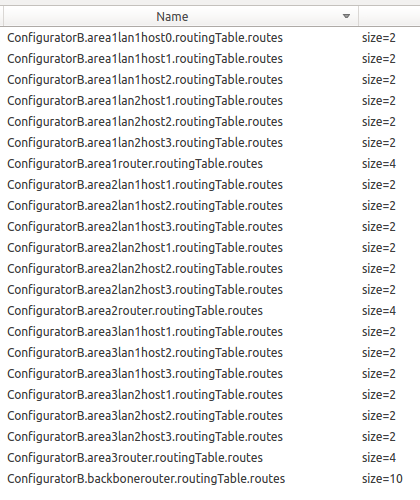 Hosts have just two routing table entries. One for reaching other hosts in their LANs, and a default route. The area routers have a rule for reaching the backbone router, two rules for reaching the two LANs they’re connected to, and a default rule for reaching the rest of the network through the backbone router. Similarly, the backbone router has three rules for reaching the three area routers, and six rules for reaching the six LANs in the network. The backbone router has separate rules for the two LANs connected to an area router, because the addresses are not contiguously assigned to the two LANs (e.g. area2lan1 has address 10.0.0.8/29, area2lan2 has 10.0.0.32/29. But area3lan1 has 10.0.0.16/29, which is between the two former address ranges). Thus, area 2 cannot be covered by a single rule. Having hierarchically assigned addresses in a network results in smaller routing table sizes, because a large distant network can be covered with just one rule in a core router’s routing table. 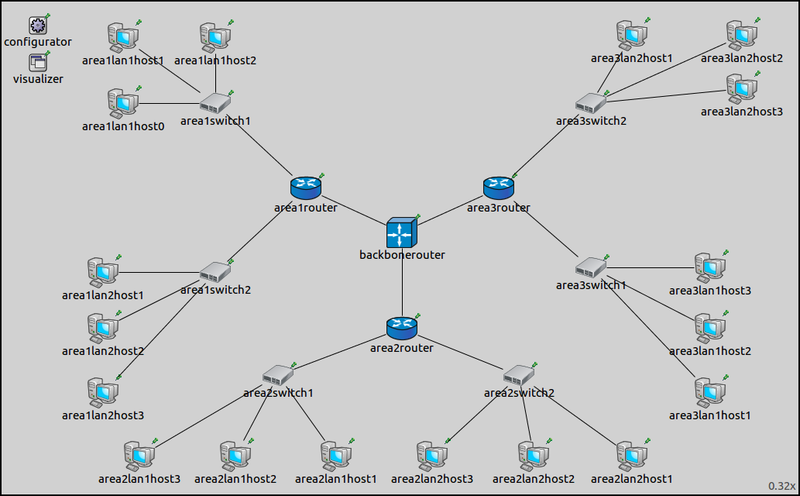 description = "Configuring a hierarchical network - C: optimized, hierarchically asssigned IP addresses and static routes"
With this setup, it is possible to cover an area with just one rule in the routing table of the backbone router. Similarly, the area routers need two rules for each LAN that they are connected to. The image below shows the assigned addresses. The sizes of some of the routing tables are displayed on the following image. Hosts’ routing tables contain just two rules, as in the previous part. One is for reaching the other members of the host’s LAN, and a default rule for reaching everything else through the area’s router. The area routers’ routing tables contain a specific rule for reaching the backbone router, two rules for reaching the two LANs that belong to the router’s area, and a default rule for reaching everything else through the backbone router. The backbone router’s routing table contains three specific rules for reaching the three area routers, and three rules to reach the three areas. The difference between the configuration for this part and the previous one is that addresses are assigned hierarchically in this part. The routing table of the backbone router contains six entries instead of 10 in the previous part. The other nodes’ routing tables remained the same. The difference is not drastic because the network is small. However, using hierarchical address assignment in a larger network would make a significant difference in routing table size. Use this page in the GitHub issue tracker for commenting on this tutorial.